Since 1946, when the the Southam and Ahearn families donated the funds to build a state-of-the-art science wing, Elmwood girls have been inspired by science. While many girls' schools of the day were building home economics spaces, Elmwood girls were excited to learn about biology, chemistry and physics. It is a legacy that lives on today with our unparalleled record of graduates studying science and engineering at university. This February we will unveil our new Science and Innovation Wing. It is, again, an inspiring time for science at Elmwood and these new facilities will ensure our tradition of excellence continues. 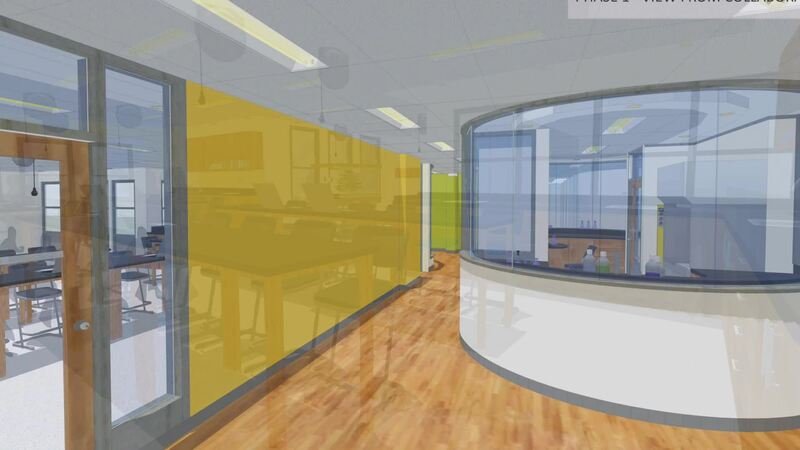 Our new state-of-the-art spaces – which include glass walled Innovation Labs and Lab Prep area with flexible furniture, a central Collaboration Hub and a Virtual Reality Room – will promote the transparency of learning, cross-disciplinary teaching and educational best practices ensuring the best possible STEM (science, technology, engineering and math) education for Elmwood girls. The “Periodic Table Art Installation” will stand as a lasting tribute to the generosity of our community and our collective commitment to the best science education for Elmwood girls. It will feature the 118 elements of the periodic table recreated in 5” x 5” acrylic tiles. Each element tile will feature the scientific details of the element plus a name or dedication. Each donation of $1,000 or more will be recognized on with an individual tile. Every year, approximately 40% of Elmwood graduates pursue STEM (science, technology, engineering and math) programs at universities and colleges around the world. According to the National Coalition of Girls' Schools girls in all-girls schools are six times more likely to pursue math, science and technology and three times more likely to pursue engineering at the post-secondary level compared to their co-ed counterparts. Does an atomic symbol match your initials? Do you have a favourite number or a favourite science-related quote? Make your $1,000 donation to the Science and Innovation Wing and claim a tile that is meaningful to you. make your donation and claim your tile today! 2019 has been designated by UNESCO as the International Year of the Periodic Table, marking the 150th anniversary of the Mendeleev periodic table, which is an iconic image and a vital tool to all who learn and work in science, at all stages of their learning and careers.